The News — The Secrets — The History! The answer to this incautious question – “Who is it?” – was a bullet to the heart. That bullet – fired by Lincoln County Sheriff Patrick F. Garrett from a .40-44 caliber single action Colt pistol – ended the life of Billy the Kid, real name William Henry McCarty. But death – ordinarily so final – only fueled the public’s fascination with Billy the Kid. What events led to Billy’s killing? Was it inevitable? Was a woman involved? If so, who was she? Why has Billy’s gravestone become the most famous – and most visited – Western death marker? Is Billy really buried in his grave? Is the grave in the right location? Is it true that Pat Garrett’s first wife is buried in the same cemetery? Is Billy’s girlfriend buried there also? The Fort Sumner cemetery where Billy’s grave is located was once plowed for cultivation. Why? What town, seeking a profitable tourist attraction, tried to move Billy’s body, using a phony relative to justify the action? These questions – and many others – are answered in this book. The book is divided into three sections. The first gives an account of the chain of events that led directly to Billy’s death, beginning the singular event that started the sequence, Billy’s conviction for murder and his sentencing to hang. As much as possible, these events are related using the actual words of witnesses and contemporaries. The second chapter tells the story of Billy’s burial and the many surprising incidents associated with his grave over the years. The third chapter lists the 111 men and women known to be buried along with Billy in the Fort Sumner cemetery, with short biographies. Sixteen of these individuals had very direct connections with Billy. Appendix A supplies Charles W. Dudrow’s correspondence regarding the locating and disinterring of the military burials at Fort Sumner. Appendix B reprints the only newspaper interview ever granted by Sheriff Patrick F. Garrett on the killing of Billy the Kid. To supplement this history are 65 photos and illustrations. These include photos of the different memorials that have marked Billy’s grave over the years, including a photo of Billy’s previously unknown second grave marker; pictures of the men – friends of Billy – who re-located the grave in 1931; pictures of Billy’s most likely girlfriend, Paulita Maxwell, and her parents; and a historic 1906 Fort Sumner cemetery map showing the location of Billy’s grave. Paperback, 154 pages. Available from Amazon. Mesilla’s sister city of Las Cruces is considering the incorporation and development of 6,480 acres of state land. This is a big increase in the area of Las Cruces — amounting to over 10 square miles. The local paper reports that this area could ultimately contain as many as 90,000+ homes. It turns out that one of the proposed development blocks contains a concrete marker built by Pat Garrett’s son (Jarvis Garrett) on the location where his Dad was shot. 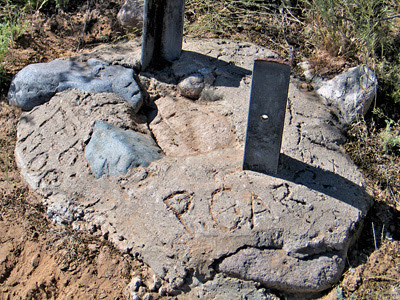 This is a well-known and famous event in Las Cruces, but evidently the existence of the marker has been a secret known only by a very few up until now. I understand the reason for the secrecy was to prevent vandalism. The marker was evidently put up by Jarvis Garrett between 1938 and 1940. 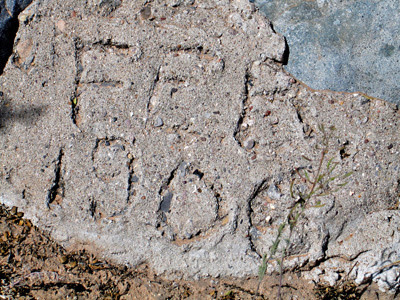 In this close-up you can see “Feb 1908” scratched in the concrete. Pat Garrett was shot Feb 28, 1908. This is an excellent cause. Information on how you can contact the Las Cruces City Council to support saving this marker is on the Friends of Pat Garrett site. Did Billy the Kid Stay at La Posta in Mesilla?